Your image as a gallery-quality mounting, in any size – that’s our premium product, the original photo print on aluminum backing. We use only the highest quality, brand-name photo paper from Fuji, Kodak, or Ilford for your photo. 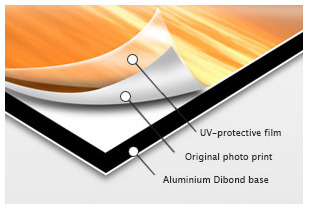 To protect against external elements, we then laminate it with a razor-thin UV film. The laminated print is then mounted on a sturdy aluminum backing. Once set on the triple-reinforced base, your work has the ideal protection against any loss of shape. 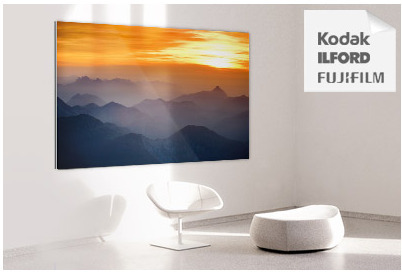 The low weight also lets you hang your favorite image on the wall with ease, even if it’s a panorama or large format. Your original photo print is mounted on the sturdy yet surprisingly light aluminum backing, which is particularly suitable for skylines and large format photos. 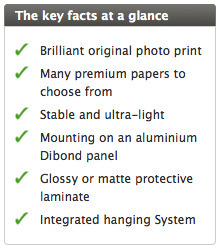 Each of our brand-name photo papers ensures the finest image detail and tonality. We then laminate every photo print with a protective film, which WhiteWall guarantees to be free of bubbles, tears, and dust. A 70 µm, razor-thin layer protects your images from sunlight, dirt, and splashes of water. This finish is available in matte or glossy, and lets you strengthen the effect of your work, either by adding shine or highlighting its rawness. Minimum size: 3.5"x3.5" Maximum size: 70"x48"
In the WhiteWall Photo Lab, we mount your original photo print onto a 0.12" thick, robust aluminum backing using a special adhesive. 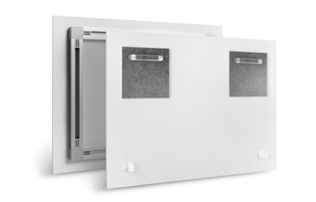 The base comprises two thin aluminum sheets primed with a platinum white enamel sandwiching a black polyethylene core. This solid material has proven itself in galleries for many years and guarantees your work has maximum stability. Despite its strength, it is also ultra light, allowing photography enthusiasts to hang their works on the wall easily and securely. The edges are cut in the exact size of your choice with the utmost precision using a CNC milling machine. We expose your image onto Fujicolor’s leading photo paper for gallery prints using the renowned Durst Lambda exposure system. We then develop it using a traditional photo-chemical process. The paper boasts an extremely broad color spectrum and is colorfast for at least 75 years. 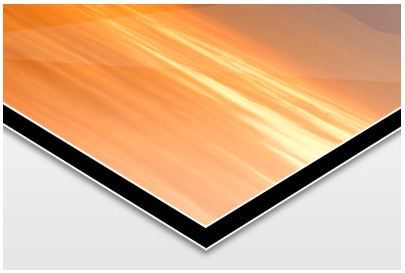 Our Fuji Crystal paper impresses with a warm base color and extreme surface glossiness. As a Kodak Pro Endura print, your work will have contrast-rich colors and brilliant highlights. Black-and-white shots will stand out on Ilford B/W paper through luminous whites and deep blacks. Whatever foundation you decide on, your image will impress with sharp contours in full resolution. Don’t waste time searching for the right hanging system for your work – your original photo print on aluminum backing is delivered ready-to-hang, and the hanging system is included in the price. We attach robust metal rails around the underside of the backing. This means you can use the full width of your work to hang it quickly and easily on the wall, and you can adjust the positions of landscape and portrait formats with a minimum of fuss. That’s quality to the very last detail. Of course, if you prefer not to have o+ur hanging system, you can simply de-select it during the ordering process.